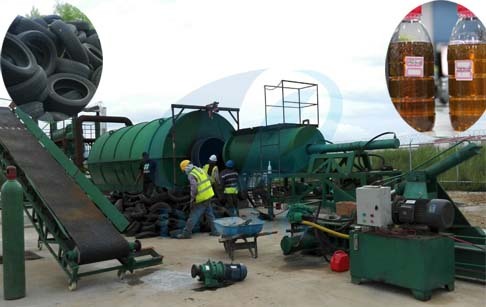 Waste tire recycling pyrolysis plant is mainly to convert the waste tire into crude oil for fuel.Recently years the technology pyrolysis plant is consistently developing.From the plant to the final product of the pyrolysis plant. Many aspects of the pyrolysis plant are advancing. We henan doing mechanical equipment co,ltd made many innovations of the pyrolysis plants. pyrolysis plant is fast developing under the time of sustainable development. And the pyrolysis technology will surely be popular in the future. Used tires are an environmental hazard. In landfills, a large pile of discarded tires can quickly turn into a dangerous fire that is difficult to extinguish and spews pollution. Improper tire disposal is illegal in many municipalities. 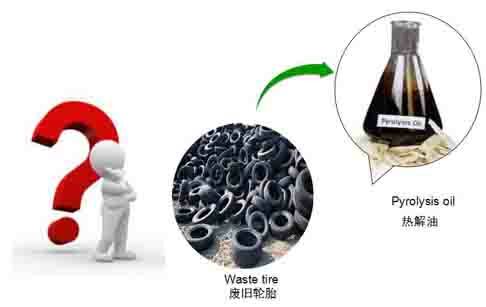 Recycled tires may become entirely new products, or a substitute for fossil fuels under certain controlled conditions. Tire recycling businesses are in demand to safely handle, store and transport tire waste. Learn the basics of tire recycling. A registered tire transporter should haul tires no longer useful to an authorized facility, such as one dealing in tire recycling. Tires can be turned into crumb rubber--simply rubber shredded to 3/8-inch particle size. Recycled tires are most commonly used as fuel in civil engineering projects; rubber-modified asphalt; vehicle mud guards; floor tiles and mats; patio blocks; and surfaces for running tracks and playgrounds. Retreading tires is also a recycling option. Create a preliminary business plan. Decide what you will need, particularly in terms of vehicles and location. Equipment will vary, depending upon what you plan on doing, but may include everything from bead removers and tread cutters to shredders. Check national and local prices for tires and crumb rubber. In your plan, don't forget to include insurance for general liability as well as vehicles and equipment. Explore community grants for green businesses and other possible funding sources for starting or expanding your business. Get government approval. A business license and proper zoning for your location is only part of the approval process. A tire recycling business may require specific permits or licenses, depending upon the location. In Texas, for example, all facilities storing more than 500 tires must be registered with the Texas Commission on Environmental Quality (TCEQ). Some permits will cost a significant amount of money. Don't forget to include those figures in your final business plan. Locate tire sources. Your local waste management department will most likely have the most up-to-date information about tire waste in your area. It is important to make connections with local businesses that receive scrap tires. Scrap tires may come from local mechanics, department stores with tire departments or auto dealers. Some cities also have a tire cleanup or tire amnesty day to allow for discarding them at no charge. Prev:How to Start the Scrap Metal Recycling Business? Next:What is the best waste tyre to fuel oil pyrolysis plant ? If you wanna to get more details about How to start a tire recycling business? you can send E-mail to market@doinggroup.com. You can consult our professional engineer and specialized sales team with leave a message in below form.We will contact with you ASAP.You also can visit our factory in Henan,China.Get Detailed address.